Chronologically, it seems, the first appearance of the simple form fish symbol came in the oldest confirmed text on record, which has yet to be Rosetta Stoned (translated), called Indu. Could some of these contain the Story of Manu? This text is from the Indus River area, on the border of Pakistan and India. This could well be the root of the Hindu culture. One of the script’s most common characters is a fish symbol standing on its tail. Often with side-kick (accent) characters. For example two to four arms, as seen below, or a single chevron over its head etc. Undeciphered text means we don’t know what meaning they used these symbols for, nor have phonetic values been confirmed. There are, however, many proposals like the following. Here, the meaning of the fish symbol is given as either star or fish. Perhaps two fish would mean star fish, which might bring Pisces (two fish) to mind. The phonetic value here proposed for fish and/or star is “min”. That makes looking at the word for seven fish, or seven stars, “Elumin” very interesting, as it raises, to the English thinking mind, the word illuminate; the very nature of stars. And seven, we will see, freaquently apears in fish tales, usually as a precurser to the number eight. In one of the very first fish stories in history, the, Hindu protagonist’s title is Manu and mankind is rescued by Matsya, a fish. These glyphs may very well have common roots with that story. Another translation sees “God” in a Chalice formed by two chalices, which are interpreted as bracelets. But again these are from just one of 100+ proposed translations. If and when the Indu language is credibly deciphered, this chapter will have to be updated. For now, let me answer the question, “what is the story of Manu?”! Manu is used in the hindu scriptures as a title for prophets or leaders designated by God. And the Sanskrit word for man is manava, which is derived directly from Manu. The most well known Manu is the current Manu who was saved with seven other men (“sages”), from the great flood, in a boat, dragged by a rope, tied to a horn on the brow of Matsya, the first and fish avatar of Vishnu! Although the version with one Manu and “seven sages” (eight men) is the most commonly known, some versions of the story do mention the family of Manu being saved also. There are also versions where Manu is the sole survivor. It is very interesting though, that the most common Hindu flood story has in common with the biblical flood story, the number of eight survivors. Here is my own poetic version of the Matsya Purana. Manu’s is the story of Matsya, the first avatar of Vishnu. And pleaded, “save me from the beasts of the indu”. So he placed the creature in a jar, but it grew. As successively larger vessels, Matsya outgrew. even the Indu river, this once tiny fishling buldged right through. Finaly the Ocean Matsya filled too! Something about filling an Ocean struck, Manu finaly knew. In return for his kindness granted Manu a boon. He said, “Build an ark for an 8 man crew. From the great flood known as the deluge. To a Mountain of dry land Matsya towed the ark, where either he, one alone, or the eight began anew. From a demon in the depths of the Ocean blue. Manu + Fish, sounds like… Manifest, the latin for which is manufestus. The following subjective relationship, like Christopher Columbus and the title ‘Indian’, connects the eastern Indian to the western Indian. More specifically, the relationship at hand is Hindu to Mayan. Ever since the 2012 hoaxe, perpetrated by mass media (espescially Hollywood, which means magic wand) the Mayan Calandar has become infamous. Take a close look at the two round objects on either side of the central figure. Tell me those don’t look like both fish, and hands. With the phonetic value of “itsak”, the Mayan Fish in Hand Hieroglyph means to manifest or conjure up. Specifically to, “conjure an image” The hand is the intelligence responsible, the cause, while the fish is the conjured image or effect. For the average western mind, most likely, the image conjured by this image, is an image of Jesus manifestation of fish and bread for five thousand people. Is it meaningless that fish symbol numbers 153, 8 & 17 make an appearance in the reference numbers for Strong’s Greek concordance words that translate to manifest? G5318. paneros- To make Visible. G5319. phaneroó – Make visible or clear. G5316. phainó- Bring to light, cause to appear. So we have Matsya and Manu, a Mayan Hieroglyph and the Story of Jesus, with several meaningful, phonetic and symbolic connections, nodes if you will. The first connection is fish, obviously, and without the second connection (manifest) it would mean little. The third is the hand references which only apply directly to the Mayan and Hindu nodes. 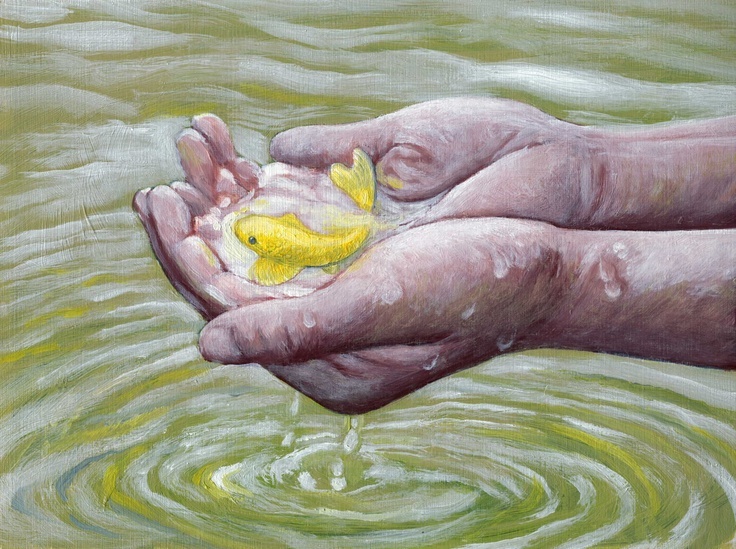 The imagery of Jesus with fish in hand is easily brought to mind, with several of his manifestation stories; as demonstrated by this illustration. Though he may have the whole world in his hands, the hands of Jesus Christ are never mentioned in the texts of these fish specific events. Let’s return to ‘manifest’ and see how the objective and subjective break downs of the word manifest will uncover more connections and perhaps bring us round to understanding how Jesus fits in along the way. One may be surprised to find an objective connection of the English ‘man’ to the Hindu Manu, as the etymology suggests that the English word “man” most likely came from the Hindu word “manu”. In fact both words, ‘manu’ and ‘man’, mean hand and man in latin. Also meaning hand in Latin is the word “mani”, along with the word “handus”, which reflects the title, “Hindus”. The Gothic word for man is “mannha”. Manna as in the Hebrew bread, manifested from heaven. Recall that along with fish, Jesus also manifested loaves of bread. The Latin word “festus” can mean feast, sieze or strike. “Festus, taken as feast, would make “manna fest” a bread festival and manufestus becomes a man festival, a feast of men. Which brings rise to the canabalistic nature of the Christian tradition of communion. Apearently, whether literally or allegorically, Jesus would have you devour him. It is well known that Jesus is equated with logos (word), “The Living Word of God”. It is most likely that the meaning behind devouring the Word of God is to learn truth or ingest knowledge. Now we have a new connection which reaches into every node yet articulated, namely the written word. The fish in hand glyph, the Vedas recovered by Matsya, Jesus, The Word of God and manna from heaven are all information, words; even the Mayan prophesy of salvation that actually spelled out their annihilation was a written word. 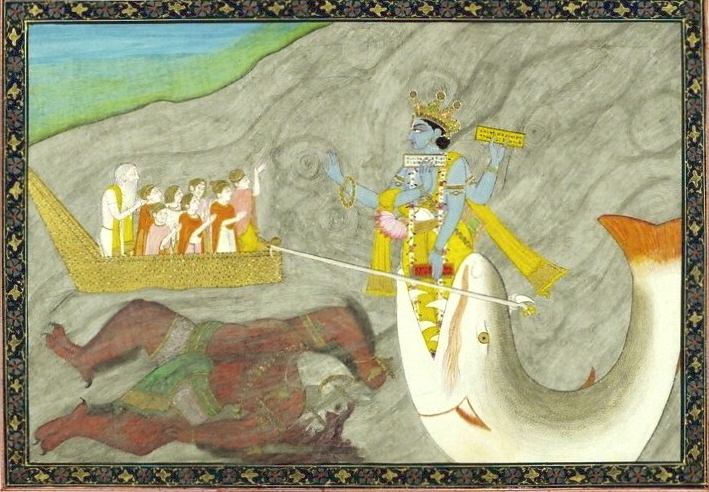 Matsya had to dive into the dark abyss to recover the Hindu sacred text. The raising of the Vedas from the depths is akin to Jesus (God’s Word) resurrecting from the pit of Hell, Just as a fish manifested in the hand is raised from the void. The reading of knowledge is the raising of unconscious information to consciousness, making the unknown known. Is essentially the same as the objective meaning of Emmanuel. So im = with and El = God, which leaves manu to mean us, man. Just as the Etymology of “man” starts with “manu”. Rather than “God with us”, Immanuel could be translated as God manifest. like Vishnu (a god) and Matsya (his presence with man as a fish), so God (El) is Jesus the fish with or as man. Quite accurately, Matsya could be titled “god with manu”. 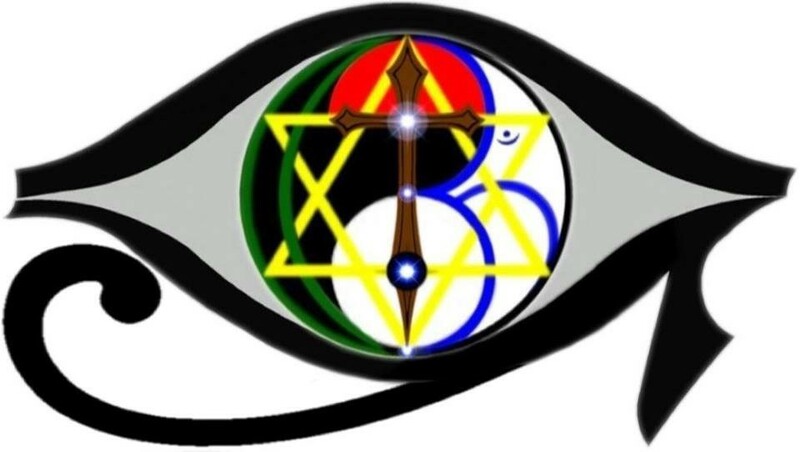 The message of oneness seems to creep through subjectively by the Hebrew word “immanu”. I’m Manu, he is Manu, he is man. The progenitor of mankind is God and God is mankind itself ie ‘I’m Manu, (signed) El’ or even I’m man U El (I am man, I am you, I am El). The objective etymology of ‘manifest’ is like to “conjure an image” where it is defined as “to show plainly” and also takes us back to hands. late 14c., “to spread” (one’s fame), “to show plainly,” from manifest (adj.) or else from L. manifestare “to discover, disclose, betray” (see manifest (adj.)). Meaning “to display by actions” is from 1560s; reflective sense, of diseases, etc., “to reveal as in operation” is from 1808. Related: Manifested; manifesting. “ship’s cargo,” 1706; see manifest (adj.). Earlier, “a public declaration” (c.1600; cf. manifesto), from Fr. manifeste, verbal noun from manifester. Earlier still in English as “a manifestation” (1560s). In the Matsya Purana, Manu is the manifest, as in ships cargo. Originally, “that which can be seized by the hand”: compounded of Latin manus, “hand” and -festus, “seize, capble of being seized”. It was the Spanish hand (manus), that came across the water to sieze the Mayan indians! This was only possible because the Maya held a prophecy of a white bearded man (aka Plumed Serpant) who would be their savior. And white bearded men is what the spanish were, though save the Maya, they did not. Between the English word manifest, the spanish and latin word manu(s), the Mayan fish in hand in the manifest hieroglyph and the Hindu Myth of Vishnu (God) manifest to Manu, and the Hebrew “manu” meaning us, topped off with Mayans being struck down by Spanish manus (hands) there is incredible alignment. And then we find this in Egypt. Recall, “Capable of Being Siezed”… Like the Maya were by the Spanish, and the Mayan glyph being a hand gripping a fish. The meaning of “seized” is like to binding, as it means being seized. So we see the word manu in Egypt alligning with Matsya tied to the boat of Manu. The over all meaning of manifest is making a thing out of a thought, to make actual or tangible, materialize, to make one of none, as if by magic or an unknown science. 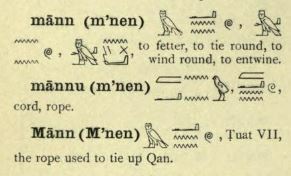 Interestingly enough, ‘man’ and ‘manu’ bear synonymous meaning to the word manifest in Egyptian. And a fishlike symbol is used as a magical amulet. Note: Manu is pulled to a mountain to the North, where he follows the receding waters down its slopes. The lions will be addressed later with Sybil and Aeon. The place where the Sun sets is the daily fate of the Sun, where the Sun is siezed by its fate. The Great Manu is also the name of the Chaldean god of fate. Unfortunately very little information is available on “The Great Manu”. The “fest” portion of the English word manifest is from the Greek “festus,” to strike. Like so many of the cues for mirraculous events, at the moment of manifestation,where a magician often strikes an object to signify that moment of magic. A practice that goes all the way back to moses and Aaron with the rod or staff, striking the object of the comming manifestation; and beyond. This striking reference will come up again with pitch, in the resurrection of the Fish. Conjure is an interesting word in its references to binding. It brings back to mind the birthplace of the chalice, where the two parent circles are conjoined. late 13c., “command on oath,” from O.Fr. conjurer “invoke, conjure” (12c. ), from L. conjurare “to swear together; conspire,” from com- “together” (see com-) + jurare “to swear” (see jury (n.)). Magical sense is c.1300, for “constraining by spell” a demon to do one’s bidding. Related: Conjured; conjuring. Phraseconjure up “cause to appear in the mind” (as if by magic) attested from 1580s. Conjure then is to conspire to constrain the mind. A conspiracy to restrict the thinking of a target’s subconscious focus on a desired image or idea. If you have studied the subject of sovereign vs subject, you know that your birth certificate has everything to do with a ships cargo (manufest). Although that subject is worthy of a whole series of blogs on its own. Now we are speaking of magic, holograms, mind tricks, mentalism, hypnosis and illusion. This brings us to one last node of The Mayans And Hindus. It turns out that “maya” is a Sanskrit word for a Hindu concept. The illusion that we are separated. The Mayans fell for Maya (illusion) based on prior beliefs.